Little Common footballer Adam Smith is poised to return to action after nine months out with a broken leg. 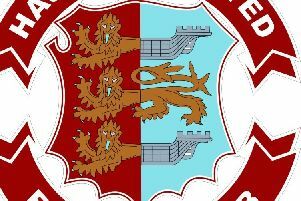 The lightning quick 19-year-old attacking player broke his tibia and fibula in the Easter Monday derby against Bexhill United last April, but would have made his comeback in a reserve team game against Sidlesham last weekend had it not been postponed. He said: “I want to play as soon as possible, even if it’s only 10 minutes here and there. It doesn’t feel 100 percent normal like before, but I’m not sure whether that will come with time. I still feel pretty quick and I’ve felt sharp in training. It’s definitely getting there and I just can’t wait to get back playing. The rod and screws that were placed in Smith’s leg to keep the bone straight as it healed remain in situ, although he has spoken to the doctor about the possibility of having them removed. “I started (light) training probably a few weeks before Christmas, but it wasn’t until after Christmas I had my first session all in,” he continued. “I’ve had a few little tackles here and there, and nothing bad has happened so far. Bexhill-based Smith also expressed sympathy for Dan Hill, who broke his leg playing for Common against Eastbourne Borough last month.